Don’t Forget How Good it is! Golf destinations, like fashion, are trendy and fickle. One day something’s in style; the next, forgotten like the wide collars and polyester of the disco days. Historically, Northern Michigan has been a “must play” destination, but has somewhat been bypassed by all the new, heavily marketed locales currently being debated in major publications. For those looking for a place that is full of character, challenging and features world class golf at a fraction of the cost of the current “big boys” of golf destinations, it is time to reacquaint with what Northern Michigan has to offer. Michigan is a golfer’s paradise. With nearly 900 courses, the largest collection of any state and being ranked 3rd in the U.S. in number of public facilities, Michigan has to be considered a golf destination of distinction by anyone. Home to designs by Ross, Mackenzie, Nicklaus, Palmer, Weiskopf, Smith, Fazio, Hills, and so many more of the game’s great architects and host to PGA, LPGA, USGA and Ryder Cup events, the quality of facilities is regularly showcased on the world stage. Unlike many other destinations however, Michigan’s allure isn’t just with the elite clubs. The vast number and variety of public access facilities that dot the landscape of this Great Lake playground are stellar challenges, highly acclaimed and a terrific bargain. Unlike more southern states, Michigan’s shortened season limits the number of days to play, but with so many courses to choose from, great deals abound. 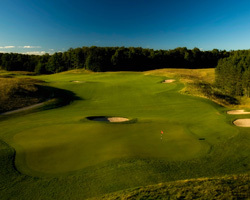 In Northern Michigan with the April to October window of opportunity, golfers can flock to the area’s wide and varied assortment of courses, ranging from the most exclusive golfing locales anywhere to the plethora of public-access layouts and resorts where good times and good stories are born. 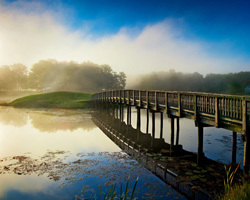 Whether it is a resort with all the trappings or a challenging daily-fee trek through Mother Nature’s splendor, Michigan provides you with the opportunity for golfing memories of a lifetime. A recent junket opened my eyes to what is available to those looking for a terrific golf experience. Nine rounds in five days covering a large part of the state gave exposure to some wonderful designs, great people and fantastic golf. The tip-off was at St. Ives, a parkland beauty at the Resorts of Tullymore and St. Ives. 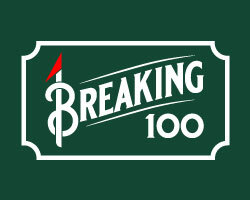 The lesser known of this two course facility is both charming and challenging. The combination of elevation changes, mixed with wetlands and the required forced carries make this layout play longer than the card indicates. The front nine has tight, narrow fairways framed with hardwoods, playing to some devilish green sites. The back routes you to a splendid collection of strategically designed water holes, including a near island green on the par 3, 16th. The finish is a brute of a par 4 playing uphill the entire way to the heavily sloped green. St. Ives is a solid test from any tee deck requiring finesse shot making to score well. Combined with the nationally regarded “Top 100,” Tullymore course, this double feature will give you great value and a stiff challenge. Next up was a round at Crystal Mountain Resort. This family friendly complex is also home to an outstanding golf academy. Whether working on your game, getting a lesson or just warming up for a round, the nationally acclaimed golf school is the place to start. The Betsie Valley course is a pleasurable stroll with nature. Water is in play on every hole, while tall pines and hardwoods frame the gently rolling fairways. The Mountain Ridge course is the showpiece of this 36 hole facility. It has a beautiful mix of subtly winding fairways routed over the sandy, rolling terrain; combined with the dramatic elevation changes of the finishing holes and their WOW factor. This pleasurable layout is forgiving, yet no pushover. Crystal Mountain is a great place to enjoy a good test of your skill and then spend the rest of the day sampling many of the après activities at the well-appointed resort. Biking, hiking, the Water Park, and alpine slide give you and the family a chance to create great memories. With the wide variety of dining and lodging available on-site, there is no need to go anywhere else. The Grand Traverse Resort is home to resort golf at it’s finest. Assembled on a rise on the outskirts of Traverse City, the area’s urban hub and America’s Cherry capital, the vistas overlooking Traverse Bay are stunning. The Gary Player designed Wolverine course presents wide fairways and receptive greens. As part of a trio of tracks, including the more famous Nicklaus designed “Bear,” Player’s design takes you through a windswept landscape of wetlands, ridges and hillsides. The layout gives the high- handicapper an enjoyable test with numerous ways to play the course. From the back-tees, this layout can present a stern test requiring a deft touch with the irons and on the greens. The finishing stretch of holes is a fantastic combination of elevation, risk-reward and demanding shot making. This up-scale resort has a variety of dining choices and accommodations, including the striking tower overlooking the bay. Traverse City provides the urban flair for those looking for nightlife and shopping as well as a chance at the tables at nearby Turtle Creek Casino. Shanty Creek has it all. A golf lover’s dream with 4 courses and resort facilities that include hiking, biking, pools, spas, outdoor games and much, much more, this is the perfect location to park the car for golfing fun and more. The resort’s original Summit course designed by William Diddel is complimented by the Schuss, Legend (Palmer) and Cedar River (Weiskopf). Each presents its own style and set of challenges. The Schuss and Summit are the more traditional resort layouts, while the Legend and Cedar River bring a fantastic championship golf experience to all. Cedar River is a real treat with a striking landscape mixed with a creative layout. Here, Weiskopf holds true to his design principles with plenty of risk and reward. He blends dramatic elevation changes, strategic use of water and hazards with tricky green-sites to test all the game you can find. Be sure to play a set of tees suited to your game, as this beast has a humbling effect. 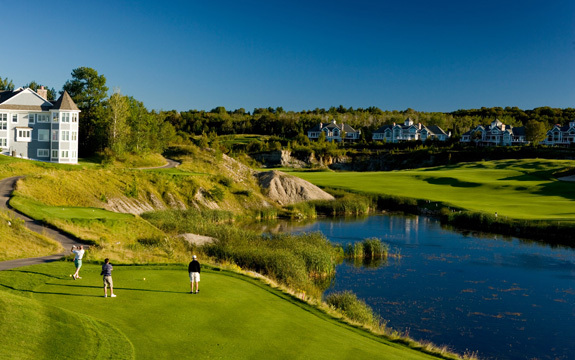 Dunmaglas, just outside of Charlevoix, is a course every golfer needs to play at least once. The quaint, welcoming clubhouse is an ironic beginning to a day. This layout is one that demands exacting shot making over dramatic slopes providing a fierce challenge. This superb test takes you through a variety of landscapes; red pine sand hills, heavily sloped, hardwood forests and fescue mounded links. Routed over numerous miles of rolling and sometimes steep terrain, this layout will test every club and every shot you have. A flat lie will be hard to find, combined with well guarded plateau greens, this course requires both distance control and deft shot shaping. Having been tamed somewhat since its opening, this layout will still dazzle you with beauty, and humble you with the challenge. The splendid collection of holes will provide plenty of discussion looking for the true signature hole. With so many choices, you could have all 18 in the debate. More famous for its skiing, Boyne Resorts has assembled a collection of eight golf courses that rival anything else for both quantity and quality. Bay Harbor is quite possibly the crowning jewel. Located just west of Petoskey, a former industrial site on the south shore of Little Traverse Bay, Bay Harbor is a 27 hole facility that has 3 distinctive nines; the Preserve, Quarry and Links. Arthur Hills has ensured that each has their own character. The Preserve presents a serene, parkland feel, the Links is a fescue lined oasis with some of the most breath-taking shoreline golf anywhere and the Quarry and its sheer faced rock wall and waterfalls is filled with plenty of OH MY! Number 7 at the Links is regarded as one of the world’s best golf holes. With the spectacular backdrop of Lake Michigan and the beautiful resort framing many of Bay Harbor’s holes, it is hard to imagine shoreline golf any better. Bay Harbor’s splendor is an absolute must. Boyne Mountain, another of the remarkable properties, is home to the Monument and Alpine courses. Both begin with dramatic downhill tee shots at the mountain top and wind their way along meadows, sharp drops and over carefully crafted water hazards. The Alpine is a terrific challenge, attested by being selected to host the Michigan Tournament of Champions. A parkland beauty, this layout is pure golf with very little trickery. Treed fairways lead to subtly sloped, speedy greens. Beautiful views of adjacent Deer Lake are presented, while facing the many downhill shots. The well appointed hotel complex at Boyne Mountain has a Bavarian theme, but it is the spectacular Avalanche Bay Indoor Water Park and exceptional beach activities that will be remembered by the family. It is easy to enjoy this wonderful pure golf experience. Gaylord, the longtime identity for golf in Northern Michigan has an array of courses that, itself could be a separate destination. Treetops Resort has mix of highly regarded layouts featuring designs by Rick Smith, Robert Trent Jones Sr. and Tom Fazio. The Otsego Club began the Gaylord golf rush, with the William Diddel, Classic course. A fun, fair respite from the bomber’s courses of today, the Classic is a good finesse, shot-makers opportunity. The Tribute, a Gary Koch beast, is a bold, demanding, yet enjoyable blend of striking elevation changes, water graced valleys, woodlands and links lands. It will give your game all it can handle. A well deserved beverage in the historic lodge awaits the inevitable post round celebrations and embellishments. Forest Dunes, near Roscommon, was the perfect culmination to this adventure. Tom Weiskopf’s signature design, built within lush pine and birch forests is a testament to old school design principles. With very little that looks like it hasn’t been there since the beginning of time, Forest Dunes is relatively flat, making it play true to the card. Each hole has its own identity ranging from lengthy dog-legs, to meandering behemoths; from the pin-point finesse holes, to the customary risk-reward holes so common with Weiskopf’s designs. Most courses have a couple weak holes, not here. Not even one marginal hole exists at this pristinely conditioned facility. The greens are some of the best you will ever experience, true, quick, but fair if your short game is Grade ‘A.’ Before Forest Dunes is inevitably included in the discussion of the truly great courses and players are lined up at the door, take the trip to experience one of the best public play facilities anywhere. As with anything in our society, we look to the newest and most current as the measure of greatest. The best fashions, cars, and technological devices are marketed as the “got-to-have” purchases. Golfers too, possess some of these habits. As we read about the newest facilities will all the bells and whistles, we tend to forget about all the places that have amazed us before. 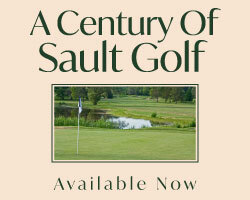 With the abundance and variety of golfing locations throughout Michigan, finding what you are looking for is easy. The nationally recognized clubs still get their deserved press, but Michigan golf is so much more. The current, trendy destinations will continue lure you with all that is new in design and experience, but like that favorite sweater that never goes out if style, Michigan’s great golf will still be there for you when you come with clubs in hand.